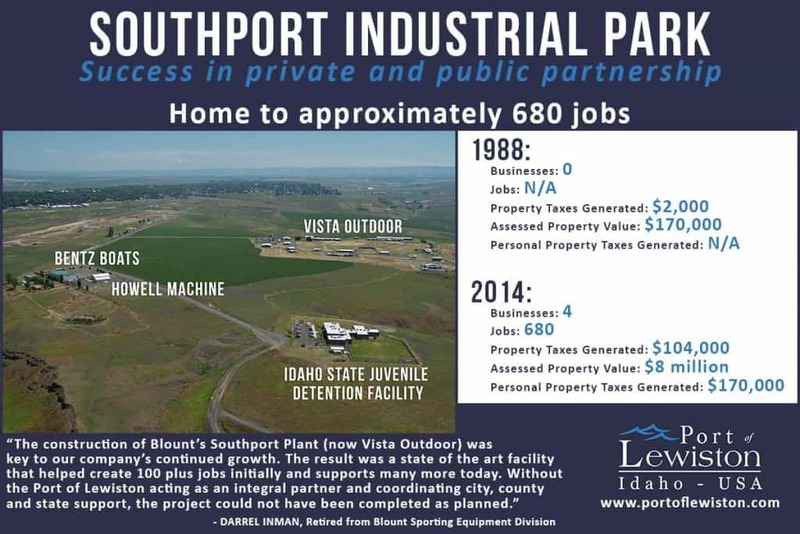 In 2004, the Port’s Southport Industrial Park transferred entirely to private ownership, returning a developed park to the tax rolls and making it one of the Port’s greatest development success stories. It is an important example of how the Port works with private individuals, private sector businesses and public agencies to facilitate economic development and job creation. Today, the park is home to approximately 680 jobs and includes the following businesses: ATK Sporting Group, Howell Machine, Bentz Boats and the Idaho State Juvenile Detention Facility. The Port embarked on development of this property in 1988 supported by numerous partners. The Port, in cooperation with the City of Lewiston and Nez Perce County, set out to help Blount Industries (now ATK) find land for expansion. General Manager of Lewiston Operations Darrel Inman said the company was expanding into Department of Defense contracting, which required approximately 500 acres of land to meet D.O.D. quantity distance regulations. Port Commissioners Gene Auer and Bob Wittman worked with landowner Earl Duthie, whose community pride played a major role in his decision to sell land to the Port for the project. Neal Deatley and Atlas Sand and Rock granted access through their property, which was another important element to creating the park. The Van Buren family and Neal Deatley made property available so Blount could meet federal clear zone requirements for ammunition manufacturers. William V. McCann Jr. negotiated land purchases from these property owners on behalf of the Port and assisted in the financing for property acquisition. Still, others were involved in bringing the development project to fruition. Nez Perce County Road Department upgraded 6th Street Grade, connecting Tammany Road to Southport Avenue. Washington Water Power (now Avista) provided electric and natural gas service lines at no charge. And, Jill Thomas-Jorgenson of the Port tirelessly wrote the grant requests that ultimately resulted in Federal Economic Development Administration and Idaho Department of Commerce Community Block Grant financial support for the project. Officials and staff from Nez Perce County, the City of Lewiston, the Airport and the Port worked countless hours to address the myriad of details generated by a project this size, and – it worked! The expansion helped keep what is now ATK in the valley and added jobs as well. This original project also created the additional 39-acre industrial park that is occupied today. Transportation: Location of the park to the nearby Bryden Canyon corridor and Fleshman Way provides easy transportation access through Lewiston, ID and Clarkston, WA, for convenient access to outlying highways. Airport: Adjacent to Lewiston-Nez Perce County Regional Airport.